Thanks to Greg in Hollywood for making note of Valerie Harper's birthday (I'm a day late!). Damian and I have been on a "Rhoda" kick thanks to MeTV recently picking up the beloved spinoff. The show was never as funny or well-written as "The Mary Tyler Moore Show." But the relationship between the three female leads -- Rhoda, Ida (Nancy Walker) and Brenda (Julie Kavner) -- was so endearing and rang so true that it was always a pleasure to watch. (And Joe's HAIRY CHEST helped me blossom into a young woman back in the day.) We're only on Season 2 now. But I watched the show as a kid and am already dreading -- as is Damian, for the first time -- the impending separation from Joe, although Rhoda's post-marriage life definitely had some memorable moments. Her memoir, "I, Rhoda," made me fall in love with her even more. Happy birthday, Valerie! I know you're been through your share of health struggles in recent years. But here's hoping you're surrounding by people who love and adore you in real life as much as your TV fans love and adore you from afar. 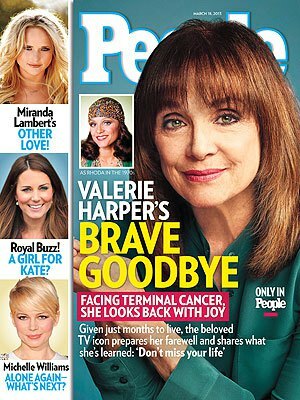 I was so devastated when I heard about Valerie's brain cancer that I bought this issue of People. Four years later, Valerie is still around and the magazine is long since lost! Why is it that the people who talk the most about having cancer , never die from it? The script was ok but she was brilliant!